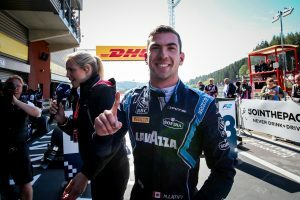 Nicholas Latifi made a dramatic return to the top step of the FIA Formula 2 Championship podium today after a lights-to-flag victory in the Sprint Race at Spa-Francorchamps, Belgium. 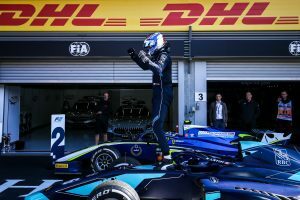 The Canadian arrived at the season’s ninth round determined to put a recent run of bad luck behind him, and he delivered in dominant style during Sunday’s 18-lap race, turning a reverse-grid pole into his first win of 2018 and the second of his F2 career. 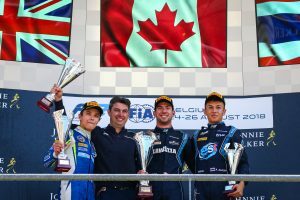 Nicholas enjoyed a strong getaway in his DAMS Racing machine, fending off an early challenge from Feature Race winner Nyck de Vries, before pulling clear of the field and eventually taking the chequered flag by 10.4sec from Lando Norris. Setting the fastest lap time was the icing on the cake and earned Nicholas a maximum haul of 17 points and his first podium since the championship visited Azerbaijan. “These races are never straightforward, but this was a good one!” Nicholas acknowledged. “The most important thing was maintaining my position into turn one – and that was tough with tons of wheelspin off the line on this low grip circuit. But the car gave me the confidence to put my head down and do my job. Once I’d managed to pull a bit of a gap, it was all about managing the tyres. Nicholas left Belgium with a haul of 21 points following a P8 finish during Saturday’s Feature Race – a result he believes should have been better. “I was missing something in qualifying, and I had an issue with the engine which was switching to safety mode and cutting revs, but Spa is a good track for overtaking so I was still hoping for more than P8 in the race,” he explained. The 23-year-old’s focus now switches to the championship’s tenth round which will take place at Monza, Italy next weekend from 31 August – 2 September. Nicholas’s FIA Formula 2 Championship programme is proudly supported by Royal Bank of Canada, Lavazza and Sofina.